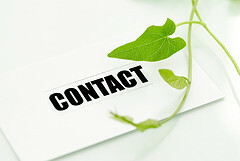 Over time, most of us amass many contacts in business. If we’re not careful – we can end up with a drawer full of business cards; which leaves us left to hunt through them when trying to remember a contact made months or maybe years earlier. Organizing and managing those contacts is important so we will remember who they are and have easy access to them when we need it. Nowadays there’s no shortage of ways to track contacts whether on your phone or desktop computer. Within Simple Sales Tracking, it is possible to manage your contacts – businesses and people – separately from your sales pipeline. While managed separately, you still maintain the ability to associate one or more contacts to one or more leads, opportunities or accounts. From there, you can easily look up and get in touch with your contacts, or synchronize them with other platforms – such as Outlook or your email marketing software.